Funding for this month’s webinar has been provided by the Alzheimer’s Immunotherapy Program (AIP) of Janssen Alzheimer Immunotherapy and Pfizer Inc. 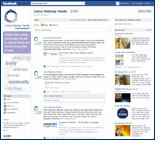 The content was planned and developed by Lotsa Helping Hands. Thanksgiving has passed, and it is officially the holiday season. For a lot of us, December is a month filled with holiday parties, trips to the airport to pick up family and lots and lots of shopping. But for others, it’s stressful to have all of the duties of caring for a loved one, plus the added stress of the winter and the holidays. There are gifts to be bought, presents to wrap, holiday meals to cook, sidewalks to be shoveled and decorations that need to go up. At Lotsa Helping Hands, we want to make this holiday season easier for you as you help out friends and family or care for a loved one. All of our Tips and Features this month should make organizing needs easier this year. Head over to our Twitter and Facebook pages and tell us how you’re helping a caregiver who means a lot to you, or what you’re doing to stay stress-free this holiday season. Read on for Tips and Features that will help you check off some of the tasks on your list this holiday season and sign up for our December Webinar—Caregiving During the Holidays. For us at Lotsa, this time of year brings about feelings of gratitude to each and every one of you who have participated in one of our communities. We envision a world where everyone finds meaning in both giving and receiving. So, from our community to yours, please accept our holiday wishes and gratitude for an amazing 2011 and an even better 2012. To help you take care of some of your tasks this holiday season, we have several exciting tips to share—remember, you can always visit our How it Works page for additional ideas on how to get the most out of your Community web site. Update Contact Info: The end of the year is the perfect time to make sure all of your contact information is up to date and properly listed in your Community. Just go to the ‘Me’ tab at the top of your screen to update your personal information. And if you’re a Coordinator, from the home page you can click on the ‘Vital Info’ tab on the left side to update any important information about the person you’re helping. Add holiday items to your Calendar: Meals and rides to the doctor's office are among the most common items on community calendars, but there’s a ton more to do during the holidays. Consider adding tasks to your calendar—from putting decorations up or taking them down, shoveling a sidewalk and driveway or making trips to the post office to mail packages—so community members can help out with some common holiday tasks. Want to learn tips for caregiving during the holidays? This December Lotsa Helping Hands is hosting a Webinar about holiday caregiving. Learn great ideas for holiday caregiving and useful tips about Lotsa Helping Hands. Register today!